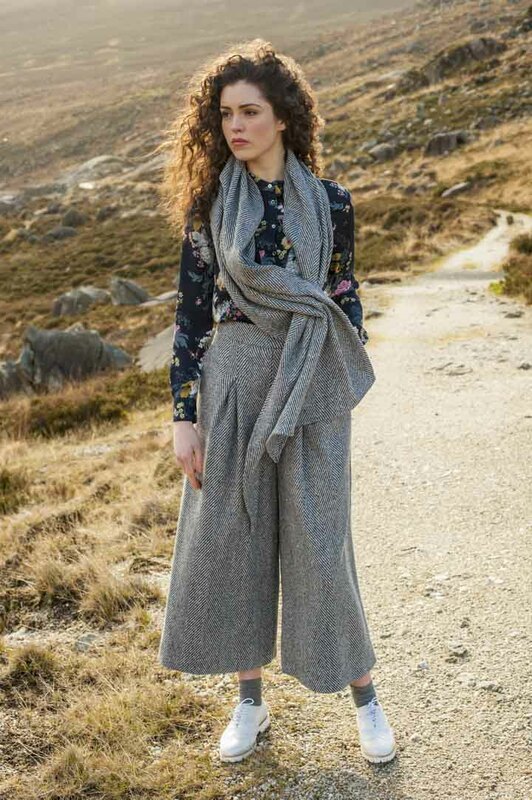 Designer Bernie Murphy tells Donegal Woman how Donegal's wild Atlantic coast has inspired her to shape a new brand that is quickly making waves. Bernie Murphy from Buncrana launched her textile business on her 51st birthday this year. Many years of textile artistry brought her to this point and recognition soon followed for her debut solo works. The Irish Made Awards by Irish Country Magazine are the most recent esteemed panel to take note of Bernie Murphy. She has been shortlisted in the inaugural awards to join many of our country’s most creative and innovative artists. As a former garment technologist with Fruit of the Loom in Buncrana, Bernie spent 18 years designing and prototyping garments for each season. When the factory closed she went back to college to explore her creative side. Now, Bernie can display the fruits of her labour with her own branding. Bernie’s collections are exclusively ‘Donegal’ creations, she tells Donegal Woman. “I called this year’s collection Homeland because they are inspired by where I live and where I was brought up. All the pieces are named after townlands and areas around me. “I wanted to put a stamp on Donegal as a northern country that can produce so much. We have the heritage and we have the skills to display,” she says. 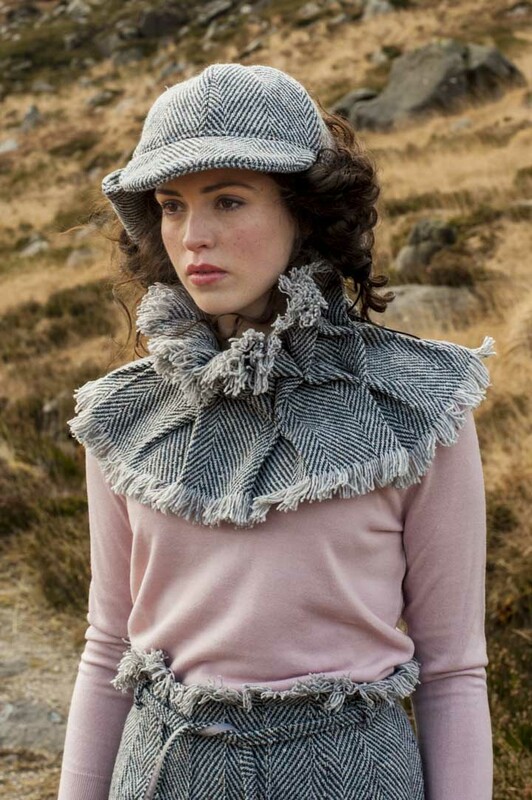 Bernie Murphy materials are all sourced in Donegal, and she uses Donegal yarns and tweeds that are manipulated with stitch. 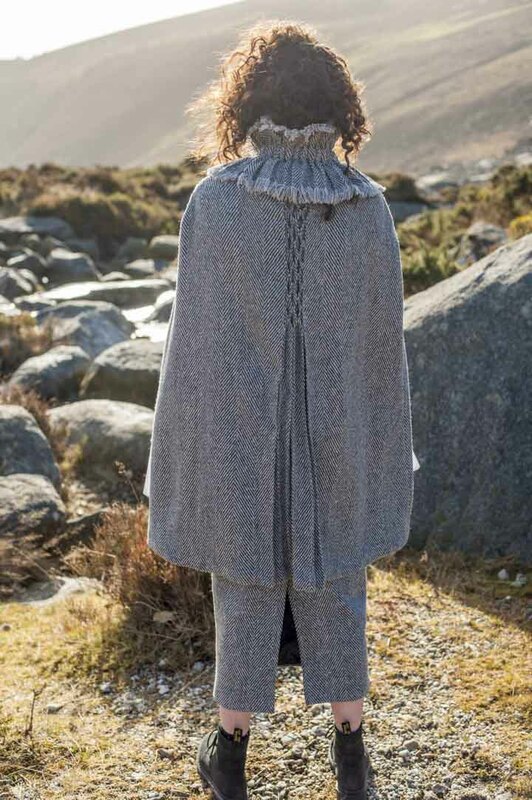 You can see the tracks of rivulets in Donegal’s beaches in Bernie’s ruched necklines, cuffs and pashminas. The cool tones and patterns mirror our rocky landscape, while neutrals and flashes of bright tones blend the contemporary with tradition. Bernie makes every piece to order from her studio in Buncrana. It is time consuming to ensure everything is Irish designed and Irish made, although she sees the unique benefits of this. “All my fabrics are locally sourced and it is great because you don’t have for to go to get your supplies. I am only an hour or more from anywhere. I can see how my materials, such as the Donegal yarns, are produced. They are also more exclusive – when the fabrics are gone, they’re gone,” she said. To win an Irish Made Award would bring more national and international recognition to BM. Each of the ten category winners will feature in a special issue of Irish Country Magazine in September and the overall winner will receive an advertising package from Irish Country Magazine worth €5,000 and a membership and mentorship prize from Guaranteed Irish. Bernie has already seen the benefits of being shortlisted, as she has connected with people online and networked throughout Donegal to campaign for votes. Bernie also flies the flag of the Donegal Designer Makers, a collective of 25 of the best designers and artisan craftspeople in the county. Warm summer weather gives Bernie time to look ahead to future collections. She plans to create again next year and is seeking local manufacturers to join in her structure. 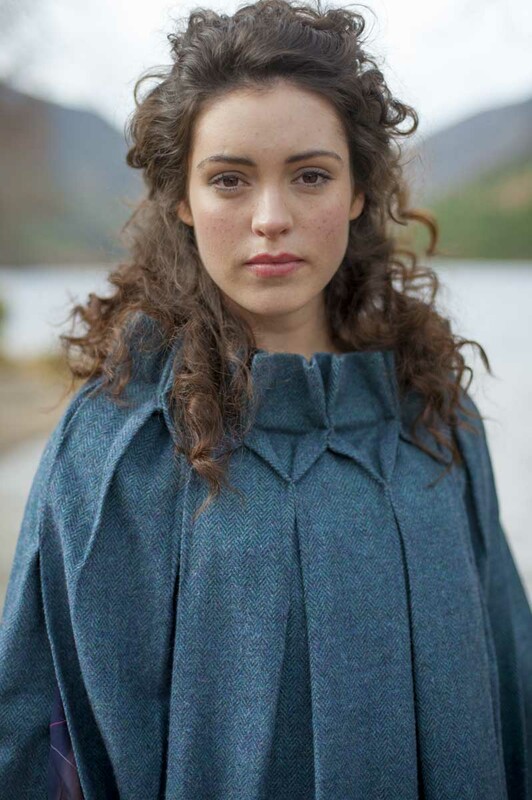 Once September comes around she assures us she will have a stack of pieces ready for cool Donegal days. Thank you so much for this wonderful opportunity to feature in Donegal Woman today. Every good wish for the success of your new business too, Donegal Woman.